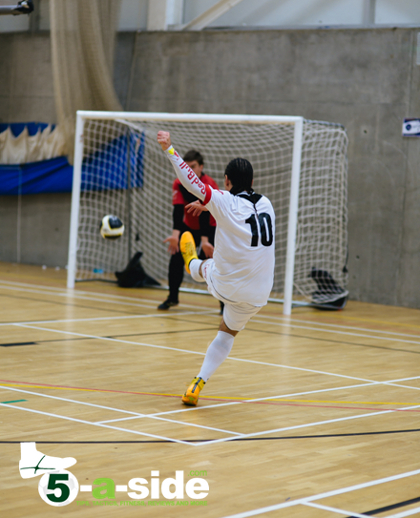 When it comes to improving your futsal, have you ever wondered what you should be focusing on? What if one of the most skillful players in the world could give you some pointers? That’s exactly what I’ve got for you here. 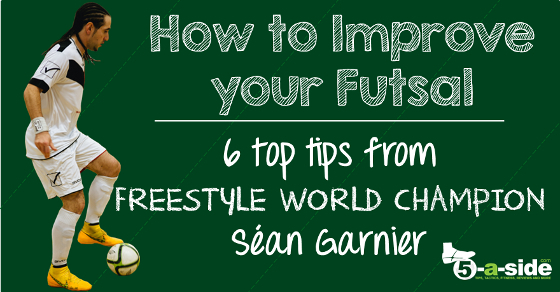 I’m sure you’ve already read the exclusive interview I did with Séan Garnier, when he made his futsal debut for London United Futsal Club. If you did, you will already know that Séan is regarded as one of the most skillful guys on this planet. It’s what made him a two-time World Freestyle Football Champion, and street-football legend (you might recognize him from the video game ‘FIFA Street’). He’s a guy worth listening to. When I met up with him in London, I couldn’t let the opportunity pass without getting his top tips to improve at futsal. 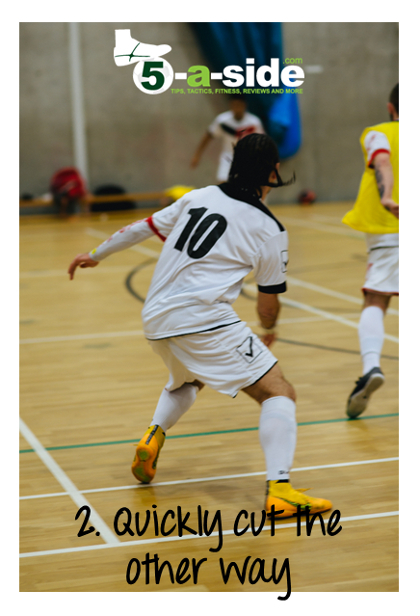 It was something heavily on his mind as he prepared for his Futsal debut with London United, and I think he’s come up with 6 solid tips that will really help for futsal and other forms of 5-a-side. Let me know what you think in the comments below. “When you see a good futsal team, you will see that their players control the ball with the sole of the foot – even if the ball is coming really fast they will take it with the sole of their foot,” says Séan. The simple truth is that you can’t play futsal well without being able to use the sole of your foot. It’s the key way you receive the ball. But it’s more than just a precise way to stop the ball; it also gives you options to instantly move the ball in any direction. It’s a point that you really need to understand (and we’ve covered it in this article about why it is all about the sole-skills when it comes to small-sided football). In fact, that’s exactly what Séan was keen to emphasize, saying: “don’t just stop the ball, come with it, move it forward.” It will give you a huge advantage. One way to improve your control with the sole of your foot is just simply passing a football against a wall and trapping it with the sole of your foot as it bounces back. As you get better, concentrate not only on stopping the ball, but on rolling it in different directions as you receive it. But if you want to take your sole-skills to a whole new level and improve your fitness in the process then you need to check out our sole-skills workout for futsal / 5-a-side. As Sean puts it, “you have to understand how to go out of the vision of your defender”. That means making those little runs that unsettle a defender and create some precious space for yourself. There’s an old saying in football when it comes to movement: “your first move is for the defender”. In other words, you make a decoy movement to trick your opponent and free yourself from their attention. By running beyond the defender and out of his field of vision, they will be forced to look round, and adjust their position. As they’re adjusting, you cut back away from them and receive the ball in the space that has been created. It’s a solid move that really works. It’s even more effective if you can make sure you’re receiving the ball on the half turn – if you want to understand why, check out this article about playing on the half-turn, it’s a small change players can make for a big improvement. We’ve all seen players occasionally having a couple of bad touches early on in a game. Who knows, maybe it has happened to you. The fact is, we all make mistakes from time to time. Not even Séan gets all of his tricks to work every time. The key is to have confidence and self-belief to dust yourself down and try again. As Sean says: “If you lose the ball or make a mistake but you are really confident you forget about it”. Not dwelling on your mistakes will keep your concentration on the game, and leave you free to show what you’re good at the next time the opportunity arises. It’s no good being able to an incredible step-over skill if you can’t shoot, pass or defend. 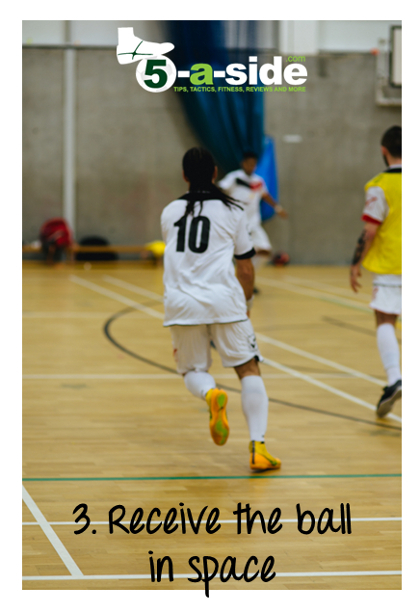 Make sure that you have a full range of weapons you can use on the futsal court by working on all areas of your game. Séan, a guy who spends most of his time working on tricks and dribbles still has an excellent pass, shot and defense on him. That’s because he has worked hard on them in the past. Futsal is an incredibly tactical game; players must know their role within the team and must follow a game-plan if they’re going to be successful. But it’s important not to let the system take away your creativity. If everybody becomes too robotic then that’s not going to lead to good futsal. Séan has the following advice: “there are a lot of tactics to think about in futsal, but don’t forget about doing your own things.” Make sure that your own individual skills and talents don’t get drowned by the demands of the team. When you get the opportunity, make sure you show what you can do. If you’re not doing that, what’s the point even playing? 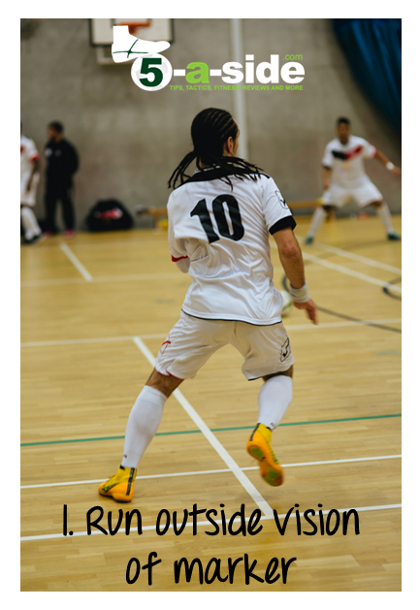 If you’re not enjoying your futsal then stop and think about what needs to change. Whether it’s your attitude; the way you’re playing; or the people you’re playing with, find a solution that works for you. Futsal is such a great game with so many physical and mental benefits that you don’t want to miss out on. That’s where 5-a-side.com can help. This is a site for players of all small-sided football, including futsal, aimed at helping you get the most out of your game – subscribe and join our community for more tips now! What would you add that Séan doesn’t have on his list? Share your tip in the comments below. Pre-match meal guide – do you know what’s best to eat before Futsal? Physical tiredness seems to lead to mental tiredness for me. It’s amazing how the two are linked and how quickly you can lose your edge when you’re not fully fit! Good comment. I agree with Francis that it is important to think and execute fast. Without those 2 abilities it is hard to get the better of your apponent. The key for me to achieve this is by having/creating a good pair of legs and peak fitness. This is very important since you need to be able to react to switch-overs which in my eyes are a crucial part of winning matches. If you can anticipate quickly to a switch-over and have the stamina to be able to explode into the desired direction you will most likely create a better position to further attacking options or improve defensive positioning. Although it is commonly said to raise your head when possessing the ball, which I agree with, I would add to also visualise the position of all players prior to receiving the ball. This will give you the options required towards your next move. That’s a great tip, thanks Francis. They say that the good players are always thinking one move ahead, and you can’t do that without a good picture of the play around you.